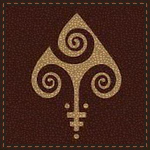 Ace Collectable Cards (Justin) designed a deck of playing cards, The Four Seasons, to celebrate the four seasons. The four suits of it represent a different time of year while the standard fifty two card deck is used to represent each week of the year. This deck will have also four Jokers representing each season and devoted to four chosen backers of this Kickstarter campaign. All elements of this deck are custom. The designer tried to incorporate a lot of classic symbols of appropriate seasons into each suit of it. Courts resulted to be very emotional characters. 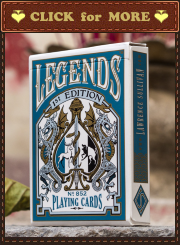 It isn’t a secret that a classic poker deck of 54 playing cards has a lot of symbolic meanings and senses. Its connection with a modern calendar is one of them. Four suits represent the four seasons. Twelve court cards correspond to the twelve months. Fifty two cards match the same quantity of weeks in a year. Thirteen values correspond to the thirteen lunar cycles in a year. Even more! If you sum up all of the values in the deck, using the Aces as one, the Jacks as eleven, the Queens as twelve and the Kings as thirteen (classic values of appropriate cards), you can get a total of 364. Add one or two Jokers, and you have a year of 365 days or a leap year of 366 days. That’s why different variations of “seasons” playing cards were, are, and will be popular. But it is always interesting to see a new artistic interpretation of this… coincidence? Should be printed by the Expert Playing Card Company. This project was funded on Thursday, May 7 2015. Now you can try to get them HERE. Spring is unexpectedly represented by vivid green Diamonds which, nicely representing pieces of ice due to their shape, are closer to winter than any other pip in a deck. Some innovation from the designer. Diamonds courts are refined and supercilious. They start each year and clearly understand their importance because of that. The House of Spring Diamonds is vested with the power to stimulate the growth of nature. So, its royals use that power and enjoy it. Spring cards are granted with a big variety of colours. Green is vivid and rich as leaves of awaken trees after some spring rain. The Diamonds pip is presumably composed with green expanded parts of some plants. Plants weave Hearts to celebrate kindness of Summer. Hearts courts are pacified and self-confident. Their suntanned bodies bask in the sun. The Queen of Hearts is waiting for the butterfly from the Jack of Diamonds as a symbol of the change of reign. Like in autumn cards, summer cards have variety of different colours. Green tints are brighter due to lights of summer sun. The Hearts pip imitates some twist of clearly distinguishable plants. Summer cards are a little bit similar to spring cards in this deck. Personally I think that some little white-yellow flowers among light green plants could add more individuality to them. Also butterflies are more associated with summer than with spring. 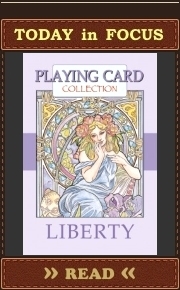 But the designer’s artistic vision fairly determines the art of this deck.